Nothing too notable to report in terms of unusual crimes last weekend in Rockville. Here's a summary of incidents reported between January 26-28. Burglary. 600 block East Gude Drive. Assault. 7600 block Indian Hills Drive. Assault. 1500 block Rockwood Drive. Theft from vehicle. 100 block N. Stonestreet Avenue. Narcotics arrest. Shady Grove Adventist Hospital. Burglary. 200 block Frederick Avenue. Theft. 200 block Rollins Avenue. Theft from vehicle. 500 block Bradford Drive. Theft from vehicle. 400 block N. Washington Street. Narcotics arrest. 100 block Park Avenue. Theft from vehicle. 1700 block E. Jefferson Street. We still don't have an opening date for BonChon Chicken in Rockville Town Square. But preparations continue. 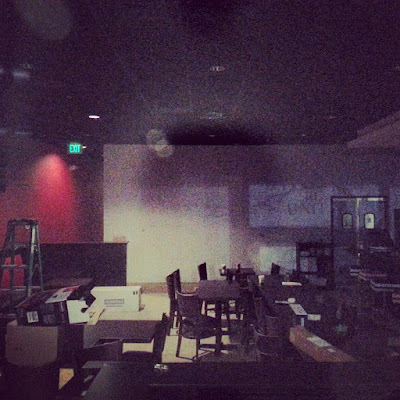 You can see some furniture inside, and the restaurant is currently hiring staff. Walgreens is getting closer to opening at the former location of The Orange Ball on 355. When Maryland and Dawson Avenues are extended in the future, Walgreens will lose about 40 surface parking spaces. At that time, the drug store will add a drive-thru pharmacy to the exterior, to address the reduction in parking spaces. I'm not sure if that will be sufficient in practice, however, but I guess we'll just have to see how many spaces are used when it opens. By my recollection, the neighboring Maxim Supermarket opposed the Dawson Avenue extension, for the same concerns about the loss of parking spaces for both businesses. I am glad Walgreens is opening, though, and imagine it will be somewhat convenient for residents of The Fitz condominium nearby. Curious about McDonald's new Fish McBites? Watch this exclusive video review to find out all about them, and how they rate. Katy Perry has designed a snack chip for Popchips, and the result is Katy's Kettle Corn. 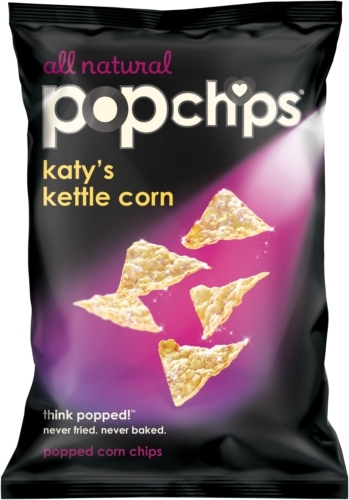 Now, watch the first and only exclusive review of Katy's Kettle Corn, and find out how they rate! Pączki are Polish doughnuts made on Fat Tuesday before Lent. Giant sells Pączki filled with raspberry jelly or Bavarian creme in the bakery section. Watch my video review to learn more about Pączki, and find out how they rate. BACON CHICKEN CLUB BURRITO IS BACK AT ROCKVILLE CALIFORNIA TORTILLA! 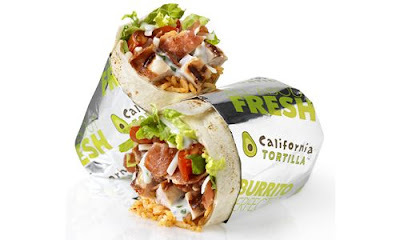 After nearly 4 years of waiting, Rockville bacon lovers can once again find the Bacon Chicken Club burrito at California Tortilla. For the uninitiated, the Bacon Chicken Club contains the following: grilled chicken breast, Monterey Jack cheese, and smoky hardwood bacon, topped with Jalapeno Ranch and Roma tomatoes, on a bed of romaine lettuce and Mexican rice, wrapped in a soft corn tortilla. Small size is $6.19. Bigger bacon appetites demand the $6.99 regular size. 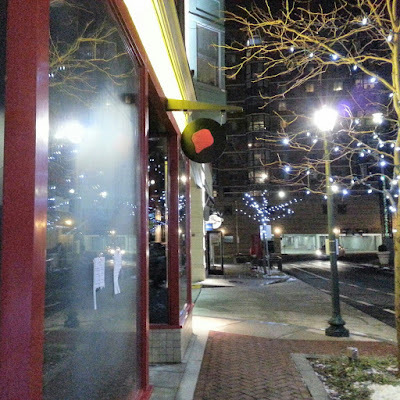 Tonight - and every Tuesday night - is Open Mic Night at Quench in Rockville. Get ready to take center stage starting at 8:30 PM tonight. Quench is located at 9712 Traville Gateway Drive. Criminals were busy in Rockville at the end of last week. According to crime data, there was a robbery reported in Rockville Town Center, 2 stolen cars, 2 assaults and a variety of thefts. Theft. 800 block of Royal Crescent at 1636 Piccard Drive. Disorder. 800 block of College Parkway. Disorder. 300 block of Martins Lane. Assault. 600 block of Twinbrook Parkway. Theft. 15800 block of Redland Road. Theft from vehicle. 15300 block of Frederick Road. Theft from vehicle. 200 block of Frederick Road. Theft. 200 block of N. Washington Street. Robbery. Potbelly, 199 E. Montgomery Avenue. Theft of vehicle. 600 block of Blandford Street. Theft of vehicle. 200 block of Hardy Place. Theft from vehicle. 1700 block of E. Jefferson Street. Theft. 11700 block of Parklawn Drive. Theft. 1200 block of 1st Street. Disorder. 300 block of Howard Avenue. Theft from vehicle. Wintergreen Plaza. Theft. 1600 block of Rockville Pike. Assault. Ritchie Center, 785 Rockville Pike. Theft. 5200 block of Randolph Road. Theft from vehicle. 5500 block of Randolph Road. The cookie with the strange name and long history is now soft-baked by Pepperidge Farm. Watch my exclusive video review to find out how they rate! The local media - with the latest example being a Washington Post article I read online this morning - is doing what it does best: controlling the narrative. In this case, the issue is the closure announcement by local grocery chain Magruder's, including their Rockville store. The "official" narrative promoted by this article and others, is that the demise of Magruder's was simply a matter of time and a "failed business model." Can I take a moment to debunk the bunk? First of all, these arguments are applying a national phenomenon of "big box vs. Mom-and-Pop" that simply doesn't apply in Montgomery County. The Montgomery County Council has done everything in its power to keep big box stores - grocery giant Walmart above all - out of Montgomery County. There are only a handful of Target stores in the county. And I believe the Wheaton Plaza Costco will be only the second in the county when it opens. Snider's Super Foods in Silver Spring is still operating, and is in a similar business position to Magruder's. So if it's just a matter of big box stores, why is Snider's still going? The facts are that the biggest pressures on smaller companies in Montgomery County are coming not from big box stores, but from developers and our own elected officials. Property taxes are the highest in county history. As I mentioned the day Magruder's confirmed it was going out of business, the Rockville Magruder's was one of the specific businesses most demonstrably, and memorably, hurt by the devastating county Energy Tax. Does anybody think a 5¢ bag tax helps grocery store profits, and encourages customers to buy more? 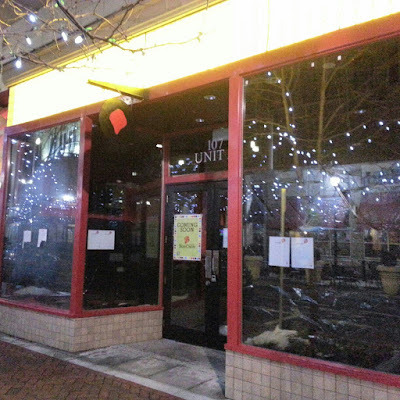 As I also mentioned, the chain's flagship county store in Rockville Town Center was condemned and demolished - for private developer profit - by the City of Rockville a decade ago. Personally, I don't believe the chain ever fully recovered from that blow. Our county's congested roads are no secret. But what you rarely hear from local media is the real impact the costs of driver hours, and fuel burnt, have on the price of goods you buy in Montgomery County. Our elected officials' failure to build the highways planners put on the books decades ago is directly responsible for the resulting costs and gridlock. Compete on price with bigger chains? Try doing that under the county-specific financial burden described above. But wait, there's more. The shopping centers where most Magruder's stores are located are now eligible for rezoning for mixed-use redevelopment, under the new zoning code the council rammed through over citizen objections last year. And, of course, Rockville rewrote its own city zoning code in recent years, making it more developer-friendly. 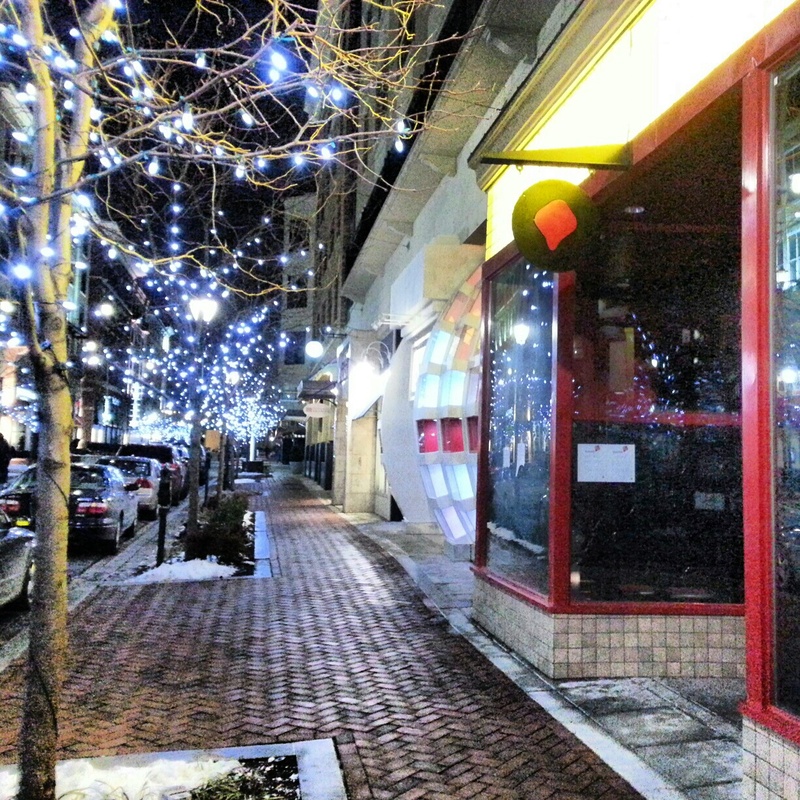 In fact, while Snider's is still in business in Silver Spring, the county and state have already quietly drawn up plans to redevelop the shopping center and neighborhood around it. Rents go up and lease terms shorten. Magruder's is not commenting publicly, so I don't know the specific terms of its leases in Rockville and elsewhere. But I do know that a Giant in Bethesda that once held a 99-year lease on its store signed a new one that expires a few years from now. Did they do that because of big, bad Sam Walton? No. They did it because Ahold bought the Giant chain, doesn't have the emotional attachment to the brand Izzy Cohen did, and the store's shopping center was bought by Capital Properties. What did the new owner want to do? Redevelop the site as mixed-use under the then-pending zoning rewrite. So they did what? You guessed it - raise the rent, shorten the terms. You can't tell me the College Plaza shopping center isn't being considered for future redevelopment by every developer in town, much like every strip mall up and down the Pike, Veirs Mill Road, and even Woodley Gardens. Didn't Giant quietly close at Wooten and Hurley a few months back? Does anyone really believe that site will be a grocery store 10 years from now? Much like Woodley Gardens shopping center, developers are already rubbing their hands together at the thought of the unlimited possibilities. Finally, there's the fact that Montgomery County forbids grocery stores from selling beer and wine, cutting off a significant profit engine for smaller grocery chains in particular. The local media spin is understandable. Divert attention to a tired punching bag like Walmart. Divert attention away from the developers and politicians actually responsible for the demise of so many local chains and businesses. No diversion in the world can mask the pathetic business environment in Montgomery County, nor the tax burden, failed leadership and crippled transportation system that ensure it stays that way. 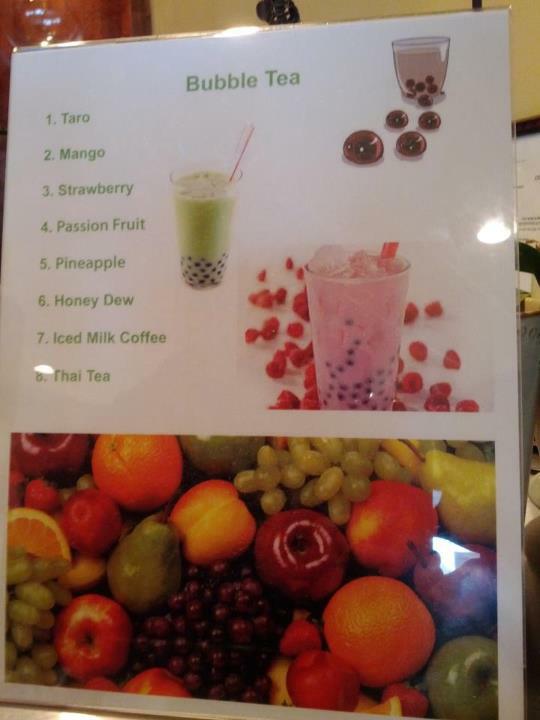 Rockville is the bubble tea capital of Montgomery County. 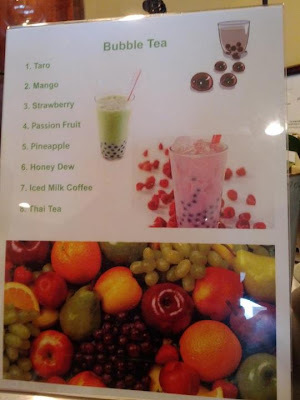 One of the many restaurants offering this popular drink is Pho Nom Nom, a Vietnamese restaurant at 842 Rockville Pike. 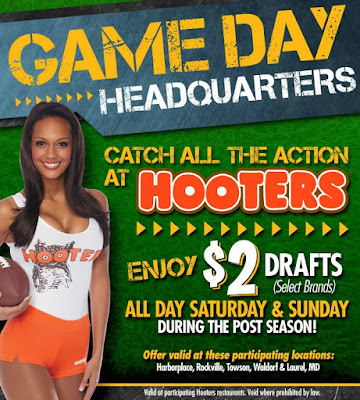 I'm kind of surprised, but Hooters is the only bar in Rockville that has made any public announcement that they are showing the Washington Capitals vs. Tampa Bay Lightning season opener tonight at 7 PM. It's kind of a big deal, with the lockout and all. 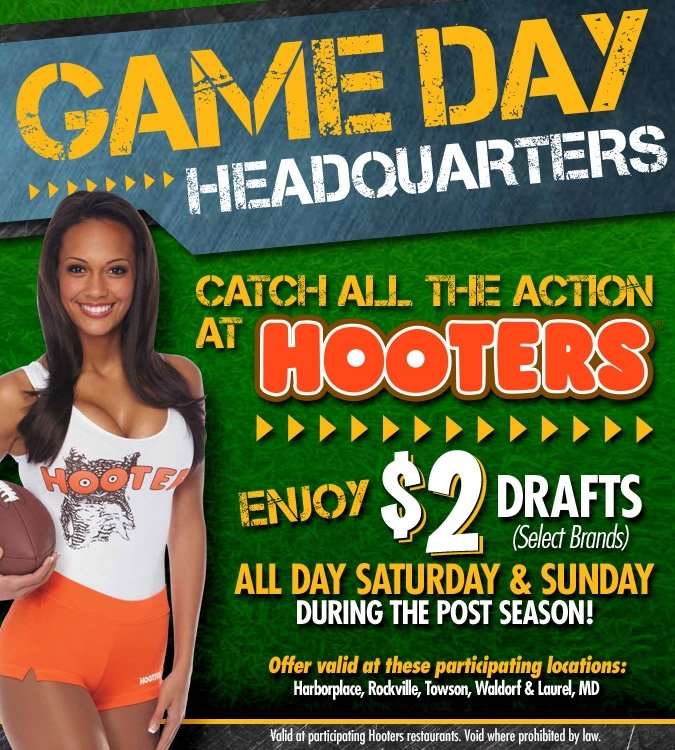 So I have to commend Hooters for actually making the effort to reach out to Caps fans in Rockville. If I hear any late announcement from other bars, I'll try to update this. A BOARDWALK-STYLE MEAL AT ROCKVILLE TOWN SQUARE? YES! A terrible winter weather day has one counting down the hours 'til summer. 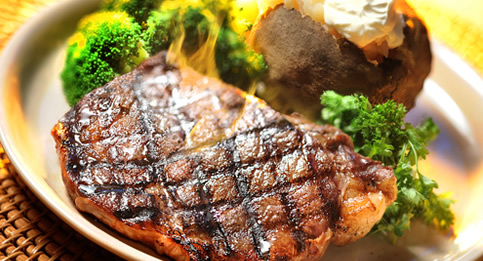 Why not make the time go faster with an oceanside meal right here in Rockville? This crab cake sandwich and boardwalk fries from American Tap Room in Rockville should make you forget the weather for a while. Magruder's supermarket in Rockville is closing, perhaps at the end of the month. Both Rockville Patch and Gaithersburg Patch are reporting store employees have told them Magruder's Rockville and Gaithersburg locations will close. The corporate headquarters of the longtime, local grocery chain has not publicly addressed the issue as of press time. If true, this is a sad day. As a lifelong county resident, I have memories of several Magruder's stores, including the one in Northwest Washington. What caused this? It sounds like a companywide problem. But with Rockville customers so critical to the chain, it's worth considering its Rockville-specific troubles in recent years. I think the condemnation of the Town Center location played a role. The City never was able to relocate Magruder's in the poorly-designed supermarket space in Rockville Town Square. In fact, no chain wanted the space until Dawson's Market finally agreed to move in. But there was also the county's ill-advised, punitive Energy Tax. Magruder's actually had to reduce its interior lighting at one point (so did Target) to save money. Like many county businesses, the Energy Tax devastated stores during an already-difficult recession. As disgraceful as the County Council's Energy Tax is, there are also the factors of the newer Giant nearby on the Pike, and increasing costs. Perhaps the company will explain the cause, but these are just some of my thoughts. If Magruder's indeed closes, it is yet another Hot Shoppes, G.C. Murphy, Chuck E. Cheese, Century Ford, etc., etc. loss for Rockville - and the DC area in general. L.A. Boxing has been acquired by UFC Gyms, a company affiliated with - yes - the UFC mixed martial arts league. Hence, L.A. Boxing Rockville's location at 192-A Halpine Road will soon change its name to, you guessed it, UFC Gym. The new brand will bring a new workout program to the facility, combining general fitness with techniques derived from mixed martial arts. However, workouts will accomodate all levels from beginner to experienced. And don't be alarmed if you are a current member - they're not going to force you to fight fellow members. It will be a fitness club, not a Fight Club! Expect the hefty corporate backing of UFC to boost your perks and bring new kinds of special events, however. Here's something to try at Bar Louie in Rockville Town Square tonight: Fried calamari with blue cheese! LITTLE DEBBIE BE MY VALENTINE CAKES ARRIVE AT GIANT - VIDEO REVIEW EXCLUSIVE! Little Debbie Be My Valentine cakes have hit the shelves at Giant in Rockville early for Valentine's Day. Watch my exclusive video review to find out how they rate. What's for dinner tonight? How about unlimited wings at Hooters of Rockville? That's right: After 6 PM tonight, you can enjoy those famous Hooters wings - all you can eat - for only $10.99 (boneless)/$12.99 (traditional)! Where else can you find wing sauces called Samurai, Daytona Beach or Habanaro BBQ? Only at Hooters, of course. Offer good for dine-in customers only. Where to watch the New England Patriots at 4:30 today in Rockville? Miller's Ale House! Every Red Bull purchase before January 20 gives you a chance to win 4 seats to the Ale House Super Bowl party. The Super Bowl party will include an open bar, and a hearty buffet, and run from kick-off til the end of the Super Bowl game. 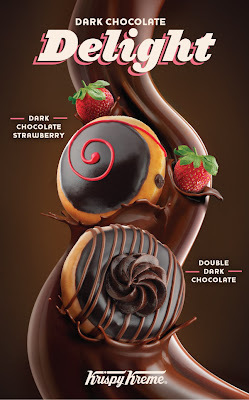 DECADENT CHOCOLATE DONUT SPECIALS AT FALLSGROVE KRISPY KREME IN ROCKVILLE! Two special chocolate donuts this month at Krispy Kreme may end up sabotaging your New Years diet resolution. Rules were made to be broken! It's too easy - they even have a drive-thru! When the Hot Donuts Now sign is on, pulling in off Shady Grove Road to get some is mandatory. Can you name the best-selling spirit/ in the world? Whiskey? Vodka? Rum? Gin? Tequila? Often compared to vodka (and that's hmmm... not exactly right, but close), Soju is a distilled spirit found in cocktails on both sides of the Pacific Ocean. But in Korea, it might be enjoyed chilled and straight. Soju ads are as glamorous as any Western alcohol marketing campaign, if not more. So if you're tired of the same happy hour, stop by a place like MOA Korean Restaurant at 12300 Wilkins Avenue in Rockville. You can get a bottle of soju, and pair it with some of the Happy Hour menu options. These include the MOA hot dog, bulgogi sandwich and wings. MOA's wings offer authentic flavors, whether your preference is DC's favorite Mambo Sauce or Korean spice. Is today Wednesday? No, it's Wingsday at Hooters of Rockville. Get 10 boneless wings, fries and sauce for only $6.99 all day long. 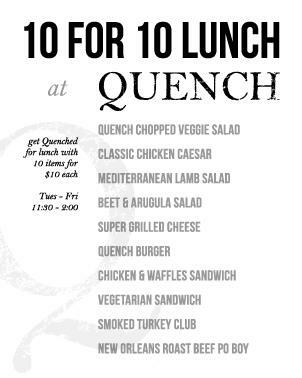 This week, Quench has launched a new lunch deal that runs from Tuesday through Friday: 10 different lunch entrées for $10 a piece. Chicken and Waffles sandwich and New Orleans Po'Boy sound good to me! 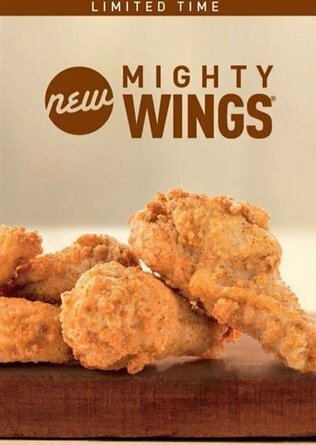 Word that testing of McDonald's chicken wings - known as "Mighty Wings" has expanded to Chicago naturally is generating speculation about a nationwide rollout. Of course, so did McPizza. But these wings aren't so new. A previous test years ago included some DC area McDonald's. I had some myself. My vague memory is that they came in a white cardboard container, and were called Mighty Wings then, too. And that they were fairly good wings. If you can add to that recollection, please leave a comment below with your memories. I don't recall the sauces available. But word that McDonald's won't have special sauces, and use the current ones instead, is cause for concern. 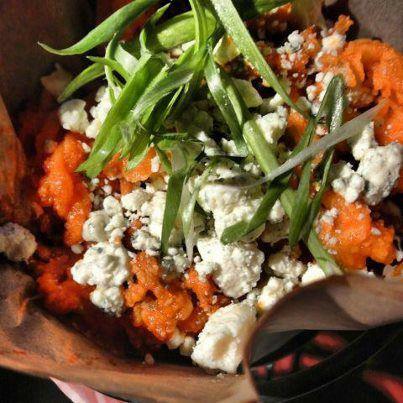 As big a fan of McDonald's nugget sauces as I am, when it comes to wings, Blue Cheese is an absolute must! 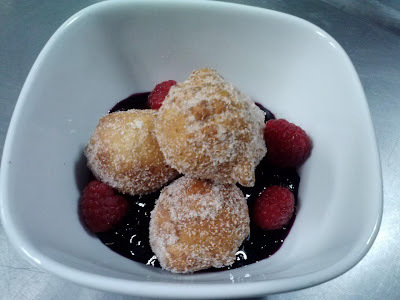 Enjoy DC Restaurant Week 2013 without leaving Rockville! Chef Geoff's Rockville (menu not online yet) and La Tasca Rockville (click for menu) are participating in the popular prix fixe event February 4-10. Lunch will be $20.13, and dinner $35.13. 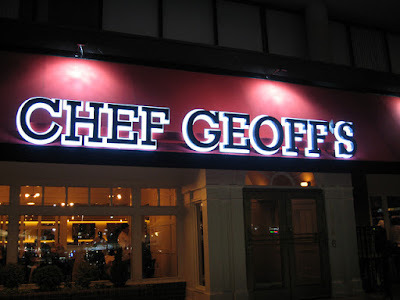 I will pass along the Chef Geoff's menu as soon as it is posted. But having dined at other Chef Geoff's locations during past Restaurant Weeks, the menu is usually quite generous - virtually the entire menu was available. Which makes it one of the best RW deals. Agh! The first full week of work of 2013. How will you make it to Friday? How about unlimited wings tonight at Hooters of Rockville? There's a new entry in the frozen burger wars that just arrived at Safeway: Ball Park Flame Grilled Cheeseburger Sliders. Will they succeed where other companies have failed in the past? Click here and find out, as I put these burgers to the test! Wendy's has unveiled an updated - and renamed - value menu. Some items, however, will exceed the the 99¢-$1.00 limit most people associate with the phrase, "value menu." The chain is struggling with higher costs, and also wants to emphasize quality as the ultimate bottom line. My personal thought is that restaurants would do best to have a shorter value or "dollar" menu, rather than put regular-priced items on it. But if the slightly-higher priced item is good enough to compete with the premium items, customers might not mind. The consumer has to feel he or she is getting a deal, for a value menu to work, in my opinion. Today, I review the just released Jumpin' Jack Doritos. Are they still as great 23 years later? Watch and find out! A new video every day, through January 6. Chef Geoff is offering a great deal at all of his DC and Maryland locations, including Rockville: Purchase any Dinner entrée from the right side of the menu, and you'll receive a FREE glass of Chef Geoff label sparkling, white or red wine. Or, a free dessert of your choice. This offer is good through February 3.